James Coney Island Baked Tots are a favorite side at the James Coney Island. Tator tots get a major upgrade, and best of all you can enjoy this treat with your favorite burger or hot dog. One of my favorite sides at James Coney Island is their baked tots. 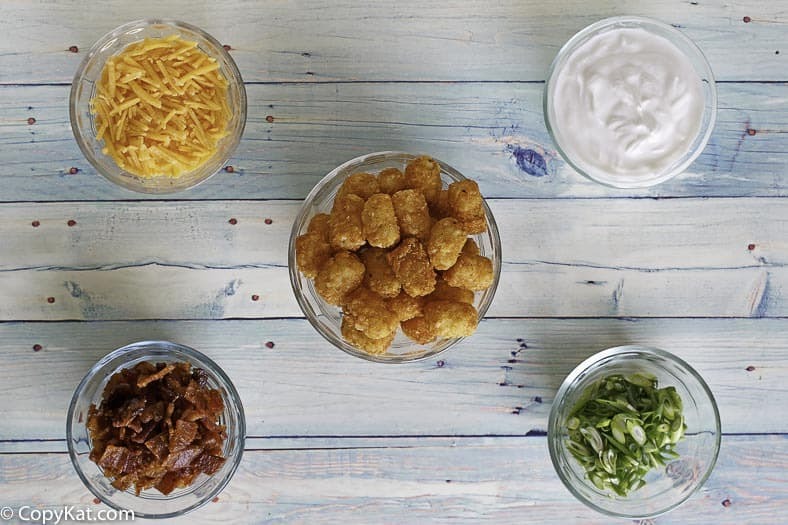 Tater tots are souped up with all sorts of extras. Sure, they are known for their Juicy Lucy burgers, or even their chili. They make so much more. It took me a long time to try a side other than the cheese fries. When you make tater tots at home, you can cook them in three different ways. You can make tater tots in an air fryer, you can bake them in the oven, or you can keep fry them in vegetable oil. It’s personally up to you. I personally like them either deep fried, or I like them cooked in an air fryer. I think air fryers do a really good job of crisping up tater tots. 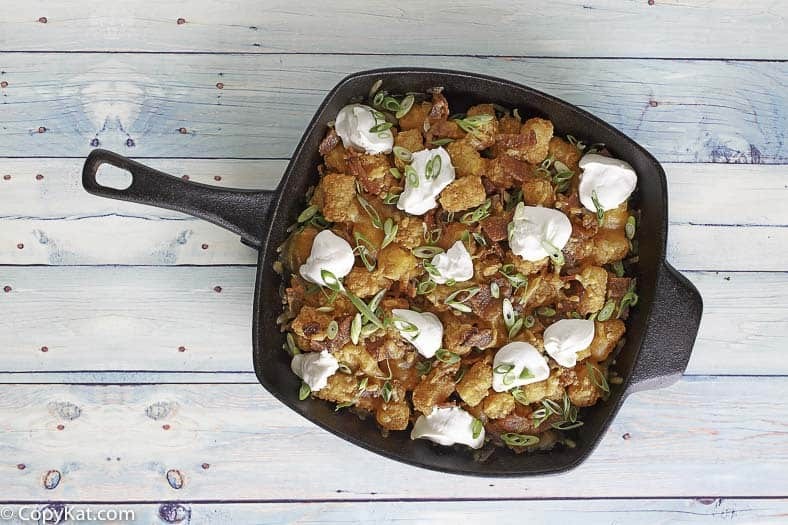 The toppings you will need for this recipe you will need a good quality Cheddar cheese, crumbled and cooked bacon, sour cream, and some sliced green onions. When making this at home I love to add a dash of Tobasco Chipotle sauce. You can make deluxe tater tots in individual serving sizes or you could make a whole big serving for everyone to enjoy family style. So I hope you enjoy these fancy potatoes soon! 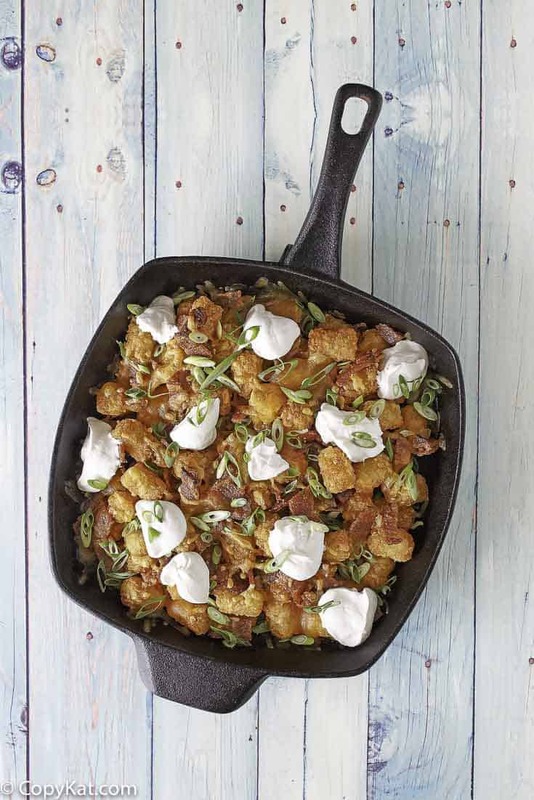 Enjoy these Baked Tater Tots at home. Preheat the oven to 350°F and spray a small casserole dish with cooking spray. Pour the oil into a deep fryer or saucepan to a depth of 3 to 4 inches, and heat the oil to 350°F. Cook half of the Tater tots in the hot oil until golden brown; this should take 2 to 4 minutes. Once the first bath is finished, drain on paper towels and then cook the remaining potatoes. Place in a prepared casserole dish and sprinkle the cheese and bacon over them. Heat in the oven for 5 to 7 minutes, or until the cheese begins to melt. Remove from oven and top with sour green and onions. I made these as my family and I had a big gaming weekend. Nothing better than leveling up with your tots! This is great, I love to make this. I am not always near a JCL. We made this for game night. It was the perfect addition to Game of Things. I love that game too! So delicious and easy recipe, I love your site. I pinned this recipe. very nice, to see that you all love this. copykat is the best website! This was really easy to make. I had tried this and really came out well than i actually expected. I haven’t had any idea that my first try would be that perfect. It took me little time to prepare this and the result was awesome too. We loved these baked tots. I love James Coney Island. I never thought about cooking tater tots like that… I’ll try it today!! Gracious good lord, those look totally mind boggling! I have to endeavor it! Much gratitude to you such an awesome sum for sharing this recipe. I genuinely need to endeavor this recipe in the coming end of the week. Reckoning see a more noteworthy measure of your posts. Indent a few wells in the surface of the tots with a ladle and crack an egg in each well. Cook the tots in the oven a little longer about 12 min so the eggs will set. I did a whole 30 oz. bag of tots in a 12″ iron skillet with 8 eggs. Our weekend guests were amazed. What a wonderful brunch idea!!!! Thanks much!